A local non-profit wants to make it easier for Torontonians to host events in the city's public parks. Photo courtesy of Toronto Park People. 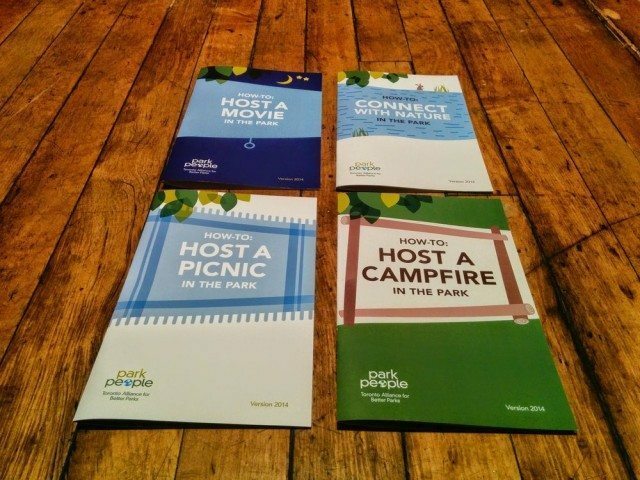 Last month, non-profit advocacy group Toronto Park People released their Park Toolkit, a series of how-to handbooks aimed at demystifying the process of hosting events in public parks. Now they want to spread the word. Tonight’s instalment of the organization’s regular Park Talk speaking series will be devoted to launching the toolkit, which includes step-by-step guides to hosting campfires, movie nights, nature events, and picnics. The free, public discussion will bring together City staff, community activists, and parks group volunteers from across the city; they’ll offer tips and advice on hosting park events, and on getting them approved in the first place—rarely a simple feat. Getting permits for movie nights or insurance for public picnics can be a frustrating task for Toronto residents—if they’re even aware hosting such events is a possibility. A campfire, for example, requires a permit (which must be applied for at least 48 hours in advance) and insurance, the prices of which vary based on the size of the group expected to attend (unless an undesignated fire pit is to be used, in which case a flat rate applies, and the event must be approved by the fire department and the park supervisor via two additional application forms). Check out Park People’s guides on hosting a campfire [PDF], movie night [PDF], nature event [PDF], or picnic [PDF]—or reserve a spot at tonight’s Park Talk.